?Halgadom is the diverse musical project of Frank Kr?mer (of the German RAC band Stahlgewitter, lyrics and music) and Sebastian Schauseil (singing). Halgadom's music fluctuates between melodic Viking/Pagan themed black metal to Neo Folk sounding ballads. Accomplished in Ernting of the year 1.999 a.y.p.s. in a time when the voices of the gods were only for few to hear, HALGADOM ascended the light of Midgard. As the weak and sick one lies broken, it's time for the resurrection of the heathen elemental force. This elemental force slumbers in any Teutonic man. Whether he likes or not! The thick mist of decay is driven out by the glaring light of Germania. Resurrected from the past! Shining for eternity!? This is written down in the booklet of the Debut sound carrier. One found support in Oliver (bass) and Sebastian (drums). Because the great distance of the drummer made regular rehearsals impossible, Sebastian worked as studio-drummer only for the recording of the first sound carrier. Therefore, he deserves our gratitude! Since the beginning of 2001., Jan has handled the drums with the new ballads; Frank is responsible for the singing. The first compact disc was released as a joint production of MOIN MOIN Rec. and Mj?lnir distribution. A song was also contributed on the joint sound carrier ?Freundeskreis der heimatverbundenen Germanen ? Mit uns oder gegen uns!?. Halgadom stands against any uprooting and mass-orientation of man. Against a world of faceless beings that have no past and so no future, too. Spurred by the recollection of our cultural roots, we'd like to show our ancestors and past lineage with Halgadom that the old belief isn't dead. It lay sheltered in our subconsciousness all centuries long. But now, as the imposed foreign belief loses its power, people search for something new they can believe in. And yet the answer is so simple. They should have a look inside of them! Only there, they will recognize themselves and only there they will finally find themselves? In 2002, it was finally realized. The second album Verdunkelung des G?ttlichen was finished. The first songs were already recorded with L? as female voice in 2000. As L? moved to middle-Germany, it wasn't as easy as used to work on. In the midst of 2002, a recording-attempt was started up to complete the session. This failed, indeed. It was about to find a new singer. That was found in Michela. After only a few rehearsals, one went to the studio to finish the opus in Ernting, 2002. The style of singing of both women differs very much, but that makes it all much more interesting. The album contains now recordings being created in a span of almost 2 years and therefore it represents a certain musical development. The main feature of distinction to the first compact disc is unmistakable. Though there were yet metal-like pieces in 1999, this new album rather tends completely to the ?Neofolk?-direction. Id est, clear singing and acoustic guitars. But this will change with the third album since some songs have already been written down to paper in heathen-metallic shape ready for recording. So, be excited? And they are coming. 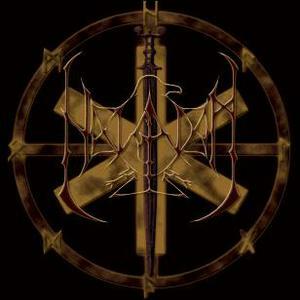 Gilbhart/October 2004 the split- EP Ahnenland with the German horde Frostkrieg is released. The song "Fr?chte gold'ner Siegeszier" was recorded together with the songs for the Sein und Werden album. So, the style of the song is comparable with the metal songs of the last long player. In the beginning of 2005 Halgadom contributed a song to the new Steinklang sampler Mia Runa. This very special sampler with 30 songs on two discs, more than 140 minutes playing time and a beautiful lay-out is limited to 888 copies and produced on the occasion of the birth of the Steinklang owner's daughter, Mia Runa. Halgadom's contribution is a newly recorded version of the song "Ostara" from Verdunkelung des G?ttlichen, which should fit this nice event well. Unfortunately some not so nice events occured before the sampler was released. After Steinklang sent out a newsletter that included a list of the participating bands, Christian Kapke, webmaster of the website lichttaufe.de, suddenly appeared on the scene. Some might know him better as the leader of the Thuringian division of the "Junge Landsmannschaft Ostpreu?en" or as frontman of his two music projects, "Eichenlaub" and "Gegentum". This man has a problem not only with his past---which, according to himself, he doesn't want to have anything to do with any longer---but also with our bass player Marcel as well as a couple of other people. When Christian Kapke, who himself contributed a song of Gegentum to the sampler, realized that also a Halgadom song should be included, he got in contact with the Steinklang owner and tried to make him take it off. Fortunately this was not possible since the production was already finished at that time, but the band's name on the sleeve had to be changed. This is why Halgadom is not labeled by its real name on the sleeve. It is called for "Tyr-Kreis" instead, which is a side project of Marcel without any own releases so far. This very strange behaviour of Christian Kapke, to make uninvolved persons suffer from his own private arguments, might be hard to understand rationally, but yet it's not very surprising for those who know him. We surely regret that Steinklang gave in so fast here, but at least this does neither affect the quality of Halgadom's contribution nor the insignificancy of the Gegentum song, as well as the general high quality of the Mia Runa sampler. On march 21st, 2006 we came to know that Sebastian would leave the band, just when the planings for the new album Sturmwoge began. Since it was Sebastian's very own decision to leave, the other Halgadom members wish him all the best for his future activities. It took only a short time to fill the gap Sebastian had left. Paul von Leichenzug will do the vocals on the new release. His way of singing is quite similar to that of Sebastian, but much more diversified. When it comes to the new songs, one must say that the band has improved again. Their structure is more complex than on the provious albums. Well prepared, the recordings began in August of 2006 in the approved Triebsound studio, so in November the first releases could be sold as digipack (???) and long-playing record. The first 100 long-playings have been produced in co-operation with UrEuropa.